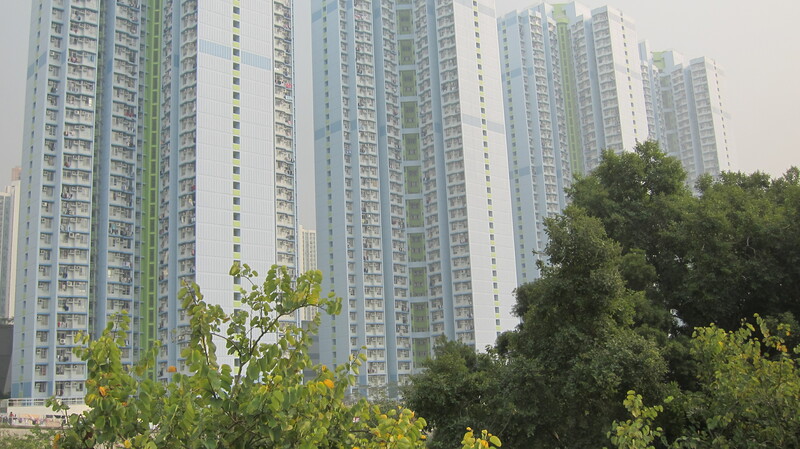 Mika Savela looks at the fate of a large scale suburban housing complex in Hong Kong. In the early years of the 1990s, a vast new town started to rise up in the North-Western corner of the New Territories region in Hong Kong. As if out of nowhere, the towering suburb of Tin Shui Wai (天水圍) – literally signifying a place enclosed by heaven and water – was born on reclaimed land. The 270,000 people neighborhood was equal in scale to most smaller western cities – telling of the size of Hong Kong’s decades-long public housing scheme. The project, however, was to become a failure on several accounts, and due to its scale the consequences were equally devastating. Public housing blocks in Tin Shui Wai. Many of the inhabitants in the cramped public housing were new immigrants from mainland China, often unemployed and unaccustomed to urban life. Situated far away from central areas, without jobs, activities or services, Tin Shui Wai quickly began to eerily resemble text book examples of bad suburban planning from the worst days of modernism. By the early 2000s, Hong Kongers had become faced with a series of suicides and family tragedies taking place in the district. Tin Shui Wai’s reputation as a “city of sadness” was cemented by the Hong Kong cinema, with several depictions of the shocking incidents as well as immigrants’ hardships and everyday resilience. 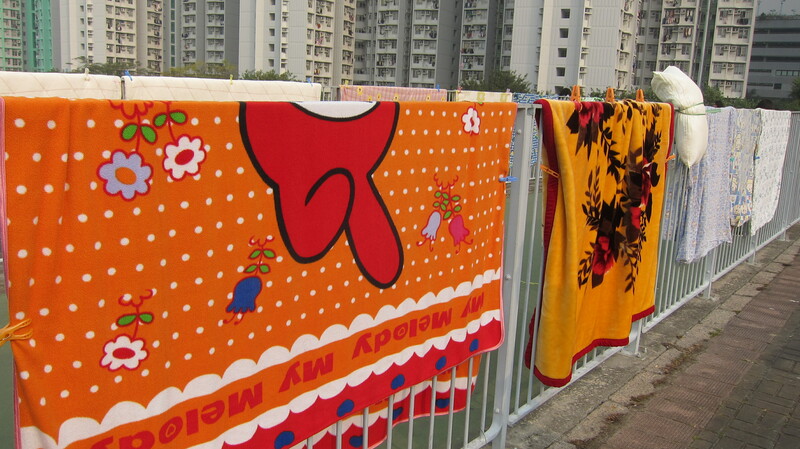 Laundry drying on the bridge railing. Seen today from afar the extremely tall and monotonous apartment blocks seem to form a unified barrier, adding to the image of a city in isolation. But reaching Tin Shui Wai on the ground level tells a more human story. Elderly people and children fill the streets, while parents stay at work late into the evening, far away in the commercial districts of Hong Kong. Unemployment and poverty persist, but people keep quietly getting by and the area appears almost sleepy and rural, bordered by a river flowing down to Shenzhen Bay, surrounded with wetlands and old village settlements. Residents dry their laundry on the bridges, and some still take out their birdcages to the park – an old practice now practically disappeared in most modernized urban areas. The government, in response to the area’s reputation, has slowly kept updating public services in the area and adding resources dealing with the social issues. Across the river, a new development is being planned. With booming Shenzhen just across the water and with hopefully some accumulated wisdom in building new towns, who knows what lies in the future for the former city of sadness. Mika Savela is an architect currently based in Hong Kong. His PhD research, at the Chinese University of Hong Kong, deals with new urban China and architectural curatorial practice. Now Tin Shui Wai is serving as a dumping ground for a mountain of construction waste. This is a reflection of Hong Kong's enormous trash generation and wasteful practice of renovating homes very frequently. So the waste, instead of being reduced or recycled, is dumped in a part of Hong Kong whose residents have no power to prevent it. Can't imagine such waste being dumped on The Peak. Secretary for Development, Paul Chan Mo-po, said the government was investigating. Should we hold our breaths for it to find the culprits and bring them to justice? Thanks for the comments Lyn and misia. I agree that my brief text can only scratch the surface on issues over Tin Shui Wai, but this also has to do with the short form essay format requested here at Failed Architecture. The entry was meant as as a short commentary, an example of something that has failed in the contributor's city, and Tin Shui Wai does fit the description in Hong Kong. An interpretation about the issues mentioned and life in TSW, can for instance be seen in the film Night and Fog (2009) by Ann Hui.\n\nOf course the question of why an urban development fails, is debatable and highly complex – there's no single reason for such declaration. If you visit Tin Shui Wai today, it might not seem that "terrible". You see people, daily life and new public facilities being built. But I think the failure aspects relate to its massive size, isolated location, sole concentration on public housing inducing high rates of poverty and immigration. In Tin Shui Wai, you rarely see adults during the day, only old people and children, as the parents are working late in the evening, far away in the business districts. Social aspects such this have an impact on the life of almost 300,000 people living in the development and its vicinity. It's hard to imagine a European city of similar size, lacking in many services, pushing inhabitants into a simplified and inescapable urban existence – resulting from urban planning, rooted in a form of modernist architectural dogma for housing ideals and efficiency, without much concern of the real-life implications. If the original CIAM manifestos were based around people separated from work places and from transport, in comparison most people in TSW can never afford cars (and in the beginning didn't even have rail transport to the city). The equation just becomes too difficult to handle.\n\nNevertheless, Hong Kong actually has a long tradition in new town building and public housing schemes, some more successful than others. In a city struggling with land shortage, small apartments and absurdly high property prices, affordable housing is a major issue. There is also a great difference in the areas that have been planned in the past and the most recent ones, where some of them can offer fairly comfortable living standards. In this great variety, Tin Shui Wai represents a development taken too far in scale, with an overtly simplistic program. However, as mentioned in the essay, the area will in the near future be connected to a new new-town development in the neighboring Hung Shui Kiu, currently a very different kind of setting. This raises many questions if the past mistakes can be to some extent repaired by future planning. 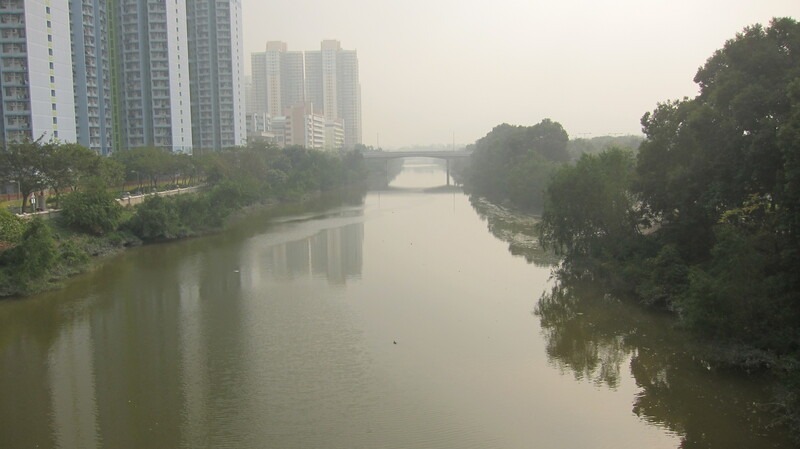 There are currently some projects looking into this area in my university, for instance, the past IFoU Winter School 2013 and an upcoming exhibition in the Hong Kong Urbanism \ Architecture Biennale 2013, organized by the MSc in Urban Design programme at CUHK.